Boombox is all-purpose viral magazine theme with a top-notch design and extremely customisable layout, full of viral snacks and exclusive features, powered by a powerful viral content builder. Populate news, listicles, polls or quizzes, spread them via social sharing, trending, reactions and up/down voting systems, drive bloggers community and monetize with any type of ads. Boombox is what you need to Go viral right now! 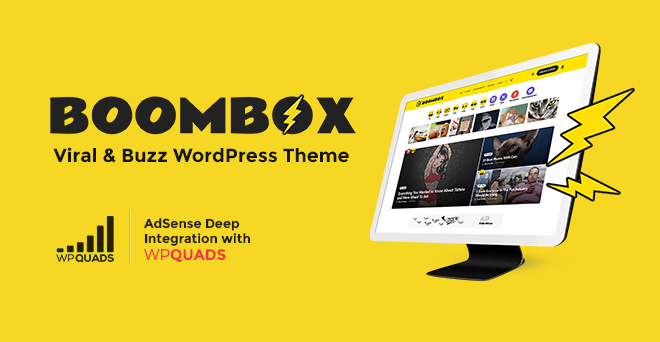 One of the most important part for success of viral sites and in viral media is advertisements, that’s why we have created this article about WP QUADS integration in Boombox as well as with brief descriptions of Boombox theme. Integration for ads in Boombox made with WP QUADS powerful plugin. Plugin gives features to set ads anywhere in the posts, pages and widgets. Now there is features to set ads in Beginning of Post, Middle of Post, End of Post, right after the <!–more–> tag, right before the last Paragraph, After Paragraph No, After Image. 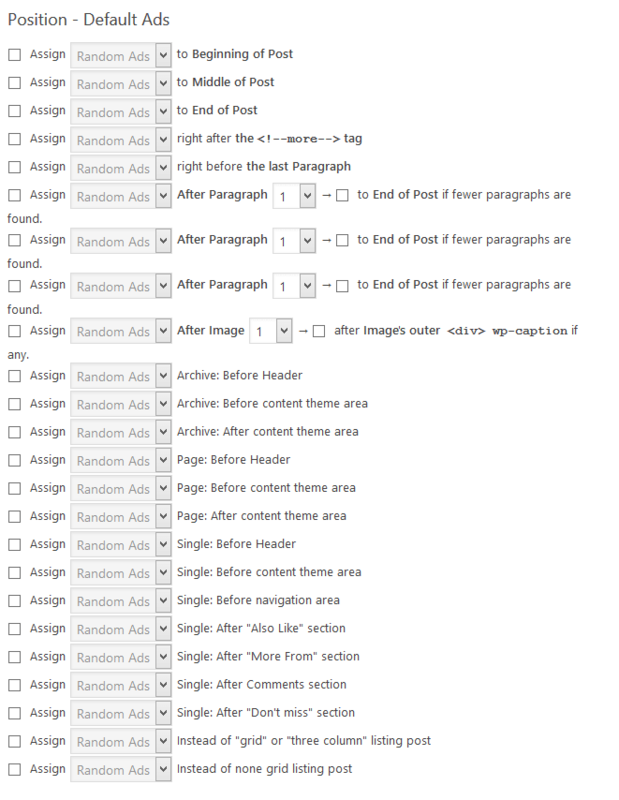 tags and categories – Before Header, Before content theme area, After content theme area, Before Header, Before content theme area, After content theme area. Before Header, Before content theme area, Before navigation area, After “Also Like” section, After “More From” section, After Comments section, After “Don’t miss” section, Right After Next/Prev navigation. With WP QUADS you can even create ads in widgets as well and since in Boombox you can set widgets in sidebar, secondary widget area and footer. This also means that you can have your ads really everywhere in your site which is very important for viral content sites. Considering also feature to use google AdSense ads with WP Quads in Boombox makes this integration priceless for every viral site owner. Besides the theme main features and customizable options Boombox includes most powerful Front-end uploader plugin. It deserves special attention because of modern and intuitive design, many types of content posting formats and for constant updates and improvements. 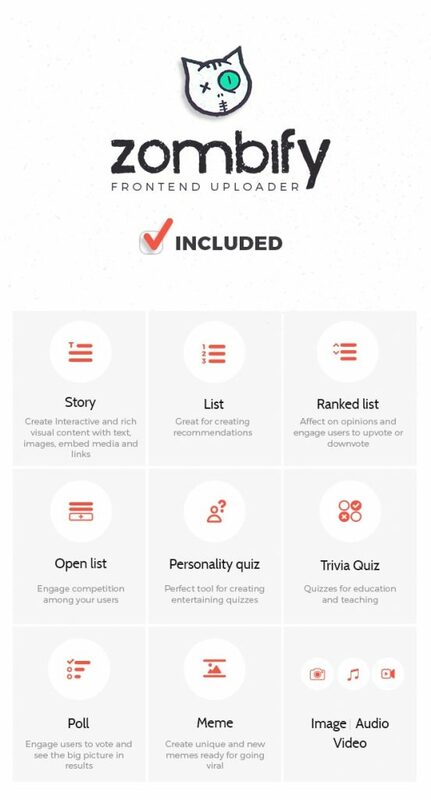 Now creating Story, List, Ranked List, Open List, Personality or Trivia Quiz, Poll or Meme is easy more than ever with Zombify Plugin. Boombox includes many useful plugins which are adding even more features and options such as Online Community, WordPress login with social network login and more. Explore all features and information about Boombox.